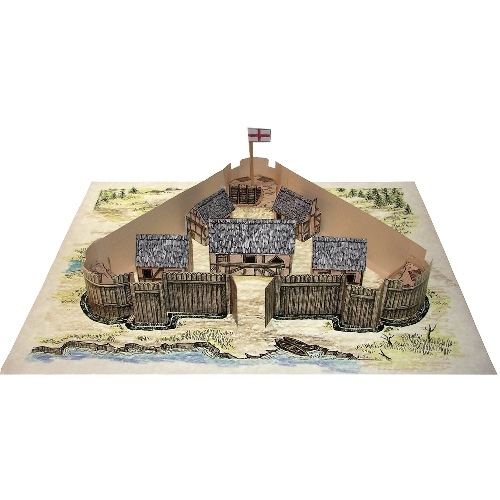 Our family is wrapping up two years of studying American history, so when I had the chance to review Home School in the Woods Á La Carte products I jumped at the chance to get a couple of products that related to our theme. They’re downloadable products, so there’s no long wait to get what you want, and the prices are very affordable. The first product I chose was ALC-1016: Name That State! File Folder Game. 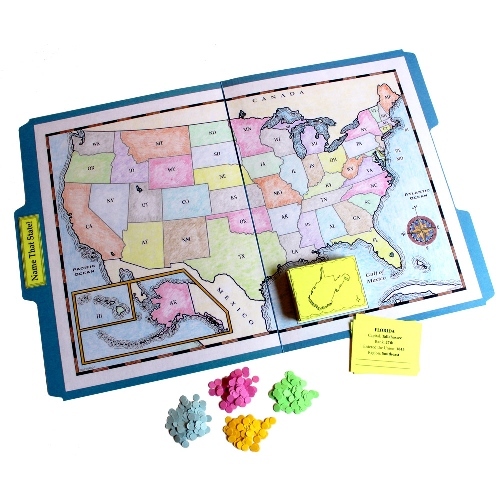 My kids have been using a lot of different things to memorize their states and capitals but we didn’t have any interactive game to play together for it. I really love to add games to our homeschool day, so I was happy to try this out. I printed the game out, but we didn’t color the game board. The game suggests using different colored paper circles (cut out using a hole punch) as board markers. We tore up full-coverage-sticky sticky notes instead because my kindergartener is a notorious board-bumper – there is no way we would make it through a game without tiny, weightless game pieces being scattered. The torn up sticky notes work great. Why yes, that is a towel draped over my ottoman, glamorously protecting my ottoman cover from cracker crumbs and assorted debris. 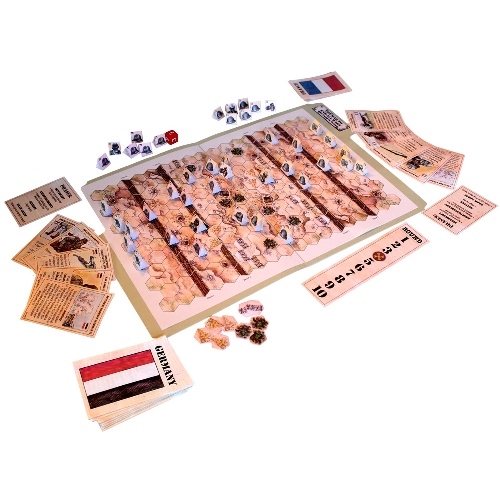 This game worked really well for all three kids to play together because each child can play at their level. My kindergartener just had to name where the state is located and started to be able to recognize some regions, too. My 7 and 10-year-old children named the state’s location, initials, and capital. Name That State! File Folder Game was a hit! The second product I chose was ALC-1048: The Art of Quilling (3D). My kids have been interested in quilling since we saw historical clothing that incorporated quilling. Funny thing – when we were actually doing the quilling project my kids noticed how similar it looks to certain traditional Chinese clothing fasteners. 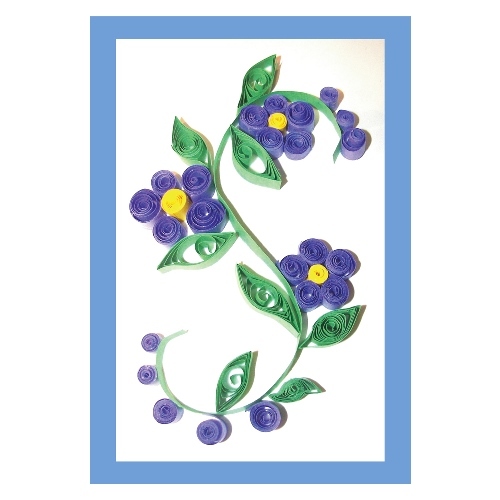 ALC-1048: The Art of Quilling (3D) is recommended for 3rd-8th grades. I’d say that’s pretty accurate, except I enjoyed it a lot, too, and I’m way past 8th grade. My 2nd grader was able to do it but my 5th grader was more capable. This is a downloadable product, so it doesn’t come with supplies that you might like to buy to make quilling easier. YMMV – it depends on how rustic, or how true-to-old-fashioned you want to be. As I’ll explain, my older child wanted to be rustic, but my middle and younger children really benefited from me buying some fairly inexpensive modern quilling tools to go along with the Homeschool in the Woods instructions and pattern. I bought precut quilling paper to make things easy on me. We used the suggested old-fashioned quilling method, which is basically taking a stick and splitting it just a bit, but that was frustrating for my 2nd grader. My 5th grader liked doing it the old-fashioned way with the stick, since he’s a fan of old-fashioned things in general. My 2nd grader used a modern quilling tool and that made things easy for her. She had no problem after that. With the modern quilling tool and quilling disk, even my kindergartener could do this project with a little help from me. Again, I separately bought some precut paper to go along with the project because I didn’t want to stand there and cut strips of paper. I felt like it was worth it to buy the precut paper. This project was SO FUN. Here are two really short videos so you can see how my 2nd grader struggled at first, but quickly got on. Again, the precut paper and quilling tool are NOT INCLUDED in the downloadable product from Homeschool in the Woods, but they went together really well. The instructions from Homeschool in the Woods, and the simple pattern, were perfect for my kids. My kids didn’t follow the color directions or even all the directions. They did their own thing and made flowers in the colors they wanted. They added a sun in the corner because that’s what life is about when you’re 7, right? The project turned out really cute. I can’t seem to get a picture that shows how really cute it is. My kids were really proud of it. It took them a while to complete it, and we now have a special “quilling tub” in our craft area, which they keep returning to. I think it’s good for developing hand-eye coordination. 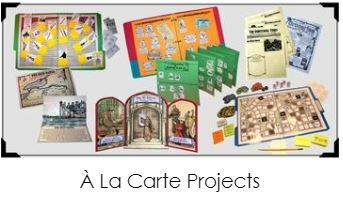 Next year I want to take my younger girls through another year of American history (based on American Girl dolls) and I will be returning to a lot of these Á La Carte products. There are so many that we could try, and they are all reasonably priced.